Welcome to our new SEO weekly roundup with Website Magazine's regular contributor Travis Bliffen of Stellar SEO. Each week, Travis will bring you a recap of recent news affecting search, a collection of highly relevant content and an actionable SEO-related tip to help you with your marketing efforts. On Feb. 14, Google was granted a patent for page speed algorithm. Page speed has been a consideration since 2009 and this patent proves it is a legitimate ranking factor. Google also received a patent for their taxonomy understanding algorithm on the same day, indicating that they can understand content based on context. If the name Matt Cutts leaves a sour taste in your mouth, or you just have a few minutes to waste, you may want to check out “Donkey Cutts” a game featuring Matt that allows you to deal with even more Pandas and Penguins. Bing has recently denied the claims that exact match domains (EMDs) rank better in their search results. Many of you remember when EMDs boosted rankings in all search engines but they are no longer advantageous according to Google, Bing and Yahoo. 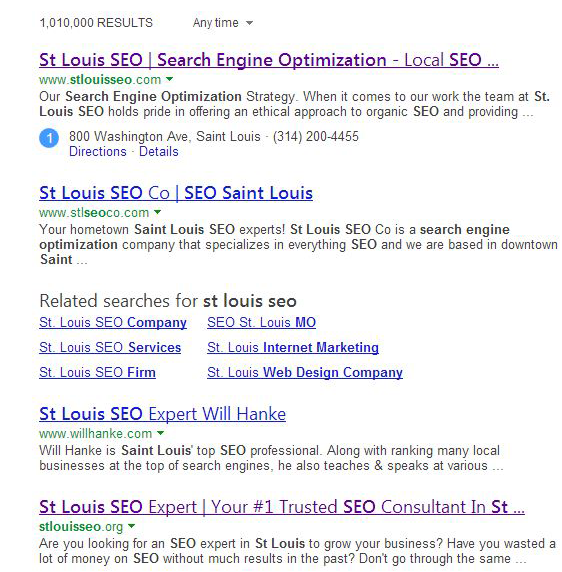 As you can see below 3 out of 4 results for the phrase “St Louis SEO” returned domains containing variations of the phrase. Does this mean Bing is lying? Perhaps, but much more research is needed to say for sure. Content marketing will be a rapidly growing strategy in 2014 as you can see in the content marketing data provided by Curata. Does your organization plan to increase their content marketing budget? The social influence scoring Klout has gotten a much needed makeover making their software much more valuable for content curating and sharing. You can find a good write up by Allison Howen on the Klout updates here. If you would rather tackle your own SEO projects, you will find plenty of great resources on our site including a recent article dispelling some common SEO myths why providing some good tips on what you can do to boost rankings. "It seems that everyone in the Internet marketing space is on the hunt for 'the next big' link building technique. Over the last few weeks I've been kicking it old school and leveraging straight email outreach. First, I find pages that have lots of outbound links on them (you can search for "100 best + niche" or "best posts about niche"). Then I reach out to the site owner to give them a heads up about my piece of content. It doesn't covert at 100 percent (not even close), but you get the best types of links possible: contextual links from relevant sites." What do you think the future of search will look like? Microsoft teamed up with the team from the newest remake of Robocop to create their version of what it will look like. If you have a question, comment, or just want to say hi, drop us an email or leave a comment below. If you like what you’re reading, please share this post on social! Travis Bliffen is the founder and senior SEO consultant of Stellar SEO, a St. Louis based search marketing and design firm. Travis has worked with several national and international clients to date and enjoys researching and writing in the search marketing field. He has been featured at speaking events and on industry leading websites such as Website Magazine and Search Engine Journal. Connect on Twitter or Facebook for updates and actionable tips.